Servias said on Thursday afternoon that he doesn’t “particularly care for” how the additional options mess with the usual flow of the game. Mariners manager Scott Servais doesn’t mind having the extra pieces to tinker with, the additional relief pitchers and crowded elbow room on the bench since rosters expanded at the beginning of September. He’s not nearly as concerned about pace of play as you are, half-asleep on the couch mumbling as yet another lefty specialist takes his sweet time jogging in from the ‘pen. And yet Servias said on Thursday afternoon that he doesn’t “particularly care for” how the additional options mess with the usual flow of the game. 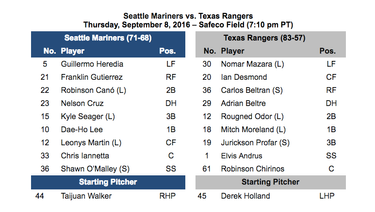 “I like having the extra players,” Servais said. “I just think you should determine your 25-man roster before the game starts and play the game. … The game just changes in September, and it shouldn’t change. You play a certain way for five months and the last month, you play differently and it’s just not right. The home series against the Rangers has averaged more than three hours of game time a pop, topping out at the 3:44 marathon that was Tuesday night’s 10-7 loss. For everybody for the purists, September baseball can feel like a slog. For the players, though, it can represent blessed relief at the tail end of a long grind. Once upon a time, O’Malley was that minor leaguer who only got an MLB look due to the rule that expands the active roster from 25 to 40 for the final month of the regular season. – The closing ceremony of the 2016 M Games took place on Thursday afternoon in Safeco’s home clubhouse following the handing out of the foosball medals. The red team, captained by third baseman Kyle Seager, won the intrasquad competition that included everything from ping-pong to water-balloon toss. – Relief pitcher Tom Wilhelmsen could rejoin the Mariners’ bullpen as soon as the opening game of the A’s series on Friday night in Oakland. Wilhelmsen, who was placed on the 15-day disabled list in late August with back spasms, threw a simulated inning on Thursday afternoon. The righty has posted a 3.20 ERA in 22 appearances for the Mariners so far this season. – Game 2 of the Northwest League Division Series between the Everett AquaSox and Spokane Indians will be hosted on Friday at Safeco Field. The opener is slated for Thursday night in Spokane, and Game 3 will take place at Everett Memorial on Saturday if necessary. Everett, Seattle’s Class A affiliate, finished with the second-best record in the Northwest League at 45-31, behind only the Eugene Emeralds down in the Southern Division. First pitch on Friday is scheduled for 7:15, and tickets can be purchased at the Safeco box office starting tomorrow morning.